Treat yourself to a high quality, handmade American Classic! Our Fruit slices come in two sizes, as well as sugar free. Offered in several different combinations, the 8oz tray is a traditional pack that is great for any occasion. Cases contain 12/8oz trays. Individually wrapped fruit slices displayed in several different stand-up boxes to match the season or occasion. Cases contain 12/5oz boxes. A favorite among convenience and retail stores. Each display contains 60 individually wrapped fruit slices. Cases contain 6/60 piece displays. For that special occasion when you need something grand, consider the 11oz Acetate Circle. Beautifully packed, each acetate circle contains orange, lemon, lime, and cherry fruit flavored slices. Cases contain 10/11oz circles. For the health conscious or individual who needs to watch their sugar intake, this sugar free candy is the perfect choice. The Sugar Free Box contains 5 oz. of individually wrapped fruit slices in four flavors: cherry, orange, lemon and lime. Offered in 30 Lb cases (6/5lb) of individual flavors in the regular size, or an assorted mix of the mini sized fruit slices. An assorted mix of the mini sized fruit slices are offered in 30 lb cases (6/5lb). 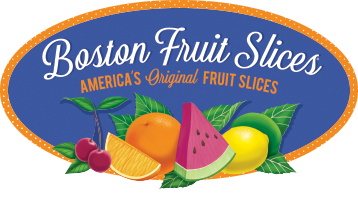 The sugar free slices are also available in a 10lb bulk carton (also individually wrapped).